Turnkey solutions for large-scale businesses with solar thermal space heating and cooling. Turnkey solutions for commercial and residential systems. An energy assessment will identify the potential energy efficiency improvements for your business and find a sustainable alternative energy option. 3D thermal modelling of your house to minimize heating and cooling demand load by implementing cost-effective passive house principles. Our solar hot water flat plate collectors heat up water. Add an absorption chiller to your large solar thermal system to provide a free cooling solution. Hot water is stored in large insulated tanks and used for domestic hot water, space and process heating, and cooling applications. Geoflow is the local partner with Savosolar and jointly provide solutions to Australia and New Zealand. 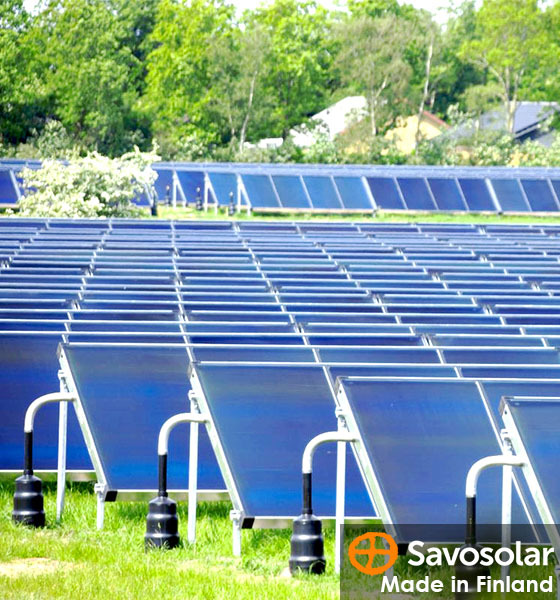 Savosolar is the manufacturer of the world’s most efficient solar collectors. The solar collectors are made in Finland and carry a 10 year product warranty. Large gas users can reduce gas consumption by up to 90% per annum. A single solar thermal system (saving $500k per year), can be installed in less than 3 months. The super-efficient Savosolar collectors require the least land or roof space for solar thermal farming. With government financial support for the business energy assessment, we can assess your energy use profile, and calculate the annual energy production and Return On Investment (ROI) with our proposed solution. Contact us to discuss how our large-scale solar thermal heating and cooling systems can save your business money. GeoFlow Australia recommends the use of Savosolar solar thermal collectors from Finland, as they can generate more than twice (205%) the amount of thermal energy compared with conventional flat plate solar thermal collectors (i.e. copper pipe and fin). 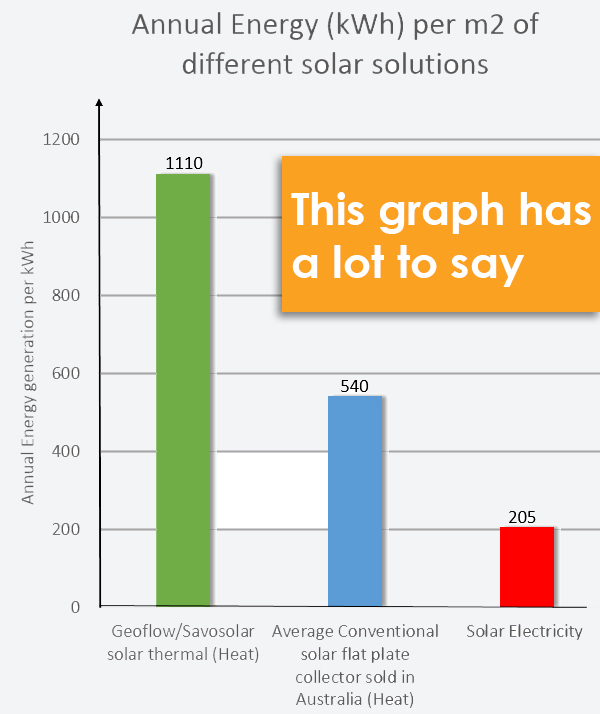 Geoflow/Savosolar solar thermal solutions can generate more than five time (540%) the amount of energy compared with solar electricity (PV) systems. So if heating is your biggest energy demand, don’t hesitate to call us for advice. Higher efficiency means less collectors and less land/roof space is required for a specific amount of annual energy. If heating is your major energy cost, a solar electricity panel will deliver 4.5 times less heat compared with our solar thermal collectors. Some Dairy farms install a heat pump with solar PV to generate heat, but note that it will cost more to install, and will never reach Geoflow/Savosolar solution heat output levels. Solar thermal energy for heating space can be stored in low-cost hot water storage tanks of different sizes. Solar electricity is stored in batteries, which cost 10 fold, and die well before paying you back. With government financial support for business energy assessments, we can assess your annual energy use profile and determine the feasibility of alternative solutions. Our feasibility study will tell you the payback period for different energy system scenarios, to enable you to decide which system best suits your energy demand and application. Contact us today to discuss how we can assist you. Geothermal solutions use 1 unit of electricity to provide 3 to 5 units of free energy (heat) from the ground. Water is circulated in pipes buried in the ground (installed in horizontal trenches, vertically drilled boreholes or in irrigation water dams) to absorb free energy from the ground and water mass, to heat and cool your home. A geothermal system can also provide domestic hot water. During the cooling mode of operation, domestic hot water will be a by-product and delivered absolutely for free. Geoflow is proud to have the only Australian Certified Geothermal Designer (CGD) as part of the team. 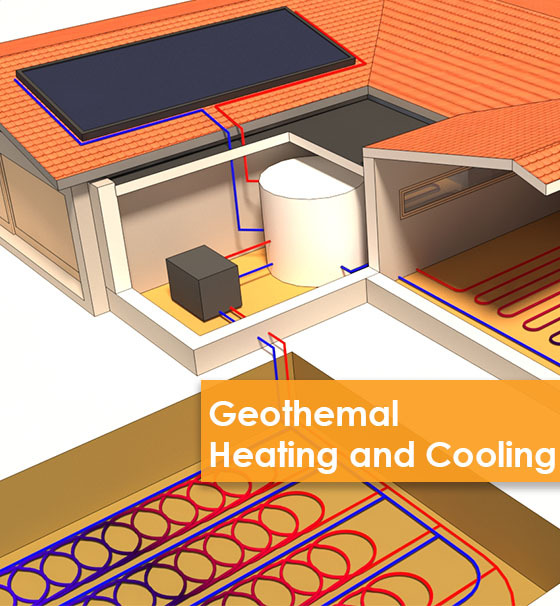 For homes with high heating demand, Geoflow combines geothermal with solar thermal to maximize efficiency and minimise installation costs. Contact us to discuss how we can assist you with design and installation of an efficient geothermal system. Data from your existing energy system is collected and compared with benchmark data. If required, extra electricity meters and temperature sensors are installed to fine-tune the most cost effective energy-saving solutions proposed for your business. Waste energy minimization and energy recovery is always our first approach. Examples include installing insulation on heat transfer pipes where required, installing flue gas heat recovery on boilers, or heat recovery on the ventilation system. Alternate fuel sourcing is assessed with emphasis on renewables like solar thermal heating and cooling, large tank storage, Geothermal and solar PV. All energy-saving measures proposed, are prioritised by the payback period, or Return On Investment (ROI), so that the business owner can decide which best suits the business. We identify a range of government subsidies that the business can apply for. New income sources, such as the federal government ERF payment for CO2 emissions reduction, are identified. Contact us to discuss how we can assist you with a commercial energy audit and saving assessment. Work in conjunction with architects to determine the best passive solar design to minimize the house energy demand and future energy costs. Accurately size the heating/cooling system, ducting, hydronic unit etc. 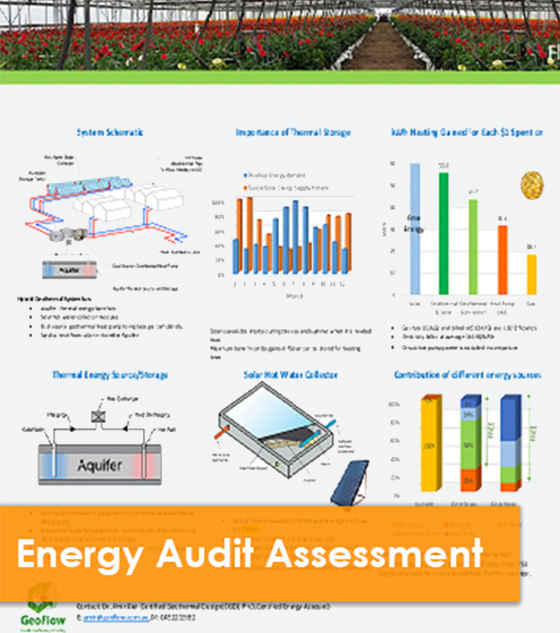 Design and assess the energy performance of the renewable system to allow making a decision based on annual and actual kWh’s and $ savings. Systems such as Geothermal, Solar thermal, Solar PV and battery storage need to be assessed for every hour of a typical year, in order to properly determine the estimated annual savings. Our energy assessments are based on NCC Section 2.6.2.2; Verification using a Reference Building method. It replaces the 6-Star energy rating or deemed to satisfy method for energy compliance. 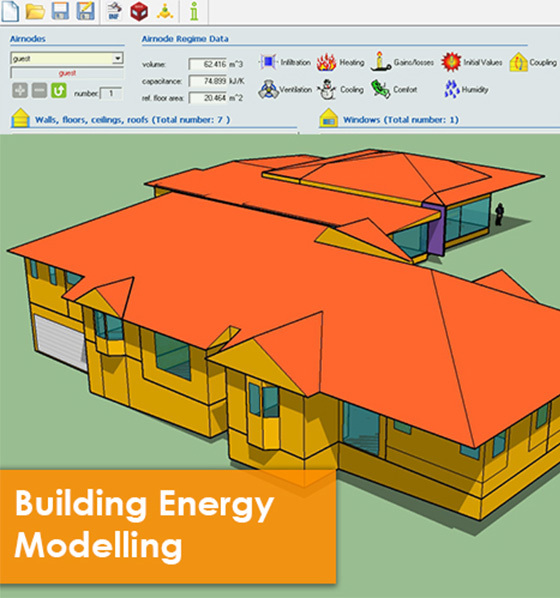 Contact us to discuss how we can assist you with your energy modelling for residential buildings.